Well appointed 3 bedroom bach with expansive views that will keep you entertained day and night. Plenty of parking and large 1685m2 section to keep the kids entertained. Sky Movies and Sky Sport on MY SKY. Wireless Internet and Netflix. 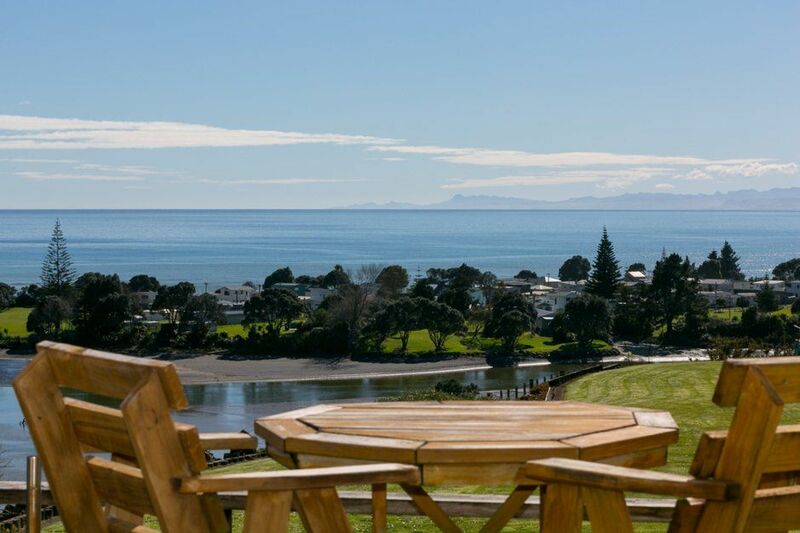 The Urenui Hotel, Mud Bay Cafe, Urenui Four Square , Playground, Bowling Club, Craft stores,hairdresser,Beauty Salon and takeaways are all a short 5 min walk away. A 10min stroll across the swing bridge takes you to Urenui Golf Course and Domain. A kids favourite is playing on the mud flats at low tide. Please remember to bring your own towels and bedding. *If you require linen the charge will be an additional $25 per person. * Cleaning can be arranged for an additional cost of $90 if required. Nice, clean and bright, loved our stay, beautiful scenery! We had a great time at Urinui! What a view! Had lots of swims, ate scones, drank nice bear at the brewery! Beautiful location and views. A short walk to supermarket and cafe's. Also nice stroll down to the river foreshore and golf course. A basic but lovely Bach with awesome views.Nice place to relax.